Jim Harbaugh is going back to his National Football League Roots and honoring the former home of both the Oakland Raiders and the San Francisco 49ers. 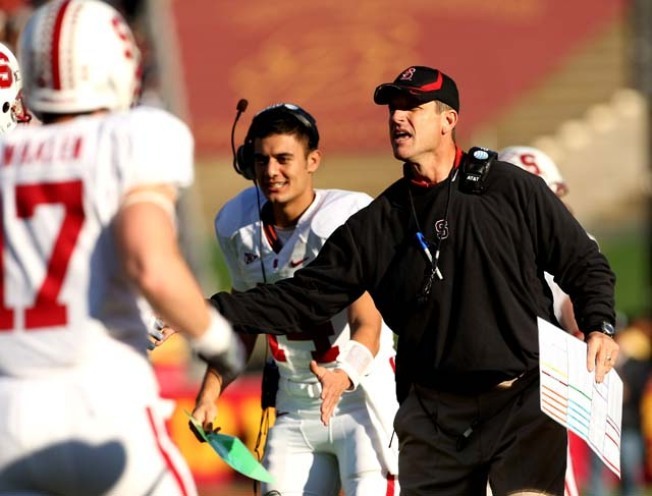 The Stanford football team will play its annual Cardinal and White spring game at Kezar Stadium in San Francisco. The stadium was home to the 49ers from 1946 to 1970 and to the Raiders in 1960. But this Saturday, starting at 1 p.m., it will be the home of Stanford head coach Jim Harbaugh and his amateur players. Harbaugh took a few minutes from a morning drive to work out final details with San Francisco Mayor Gavin Newsom at the stadium to call into local sports talk radio KNBR and said he remembers growing up in Michigan and watching the Packers play the 49ers at Kezar. "Kezar is the cradle of Bay Area football," he said. As part of the deal, Stanford will donate $10,000 to the Recreation and Park Department’s Youth Scholarship Fund and towards recreational programming. The game is free for fans to attend and there will be an autograph session afterward with current and former Stanford players.